Gary Pearce, who has known his share of North Carolina governors and can tell a hawk from a hand-saw, has taken a measurement of our new governor. According to Pearce, Pat McCrory has "no core beliefs." He's equipped only with a "fuzzy-minded version of jargon-filled conservatism." "He’s good at the show," meaning he's a glad-handing idiot who likes schmoozing. "But the work? Not so much." "Being Governor is hard work. It’s more than showing up. It takes studying and learning. It takes listening to people and managing people. It takes a vision and persuasion. Without that kind of governor, a state can get outworked – and left behind." We have a squishy time-waster for governor and an out-of-control extremist General Assembly all too happy to take charge. We are fucked. Read the end of this article for a take on what McCrory SHOULD be. Who cares what Gary Pearce thinks about Pat McCrory? He is biased to any person other than a liberal, progressive Democrat. 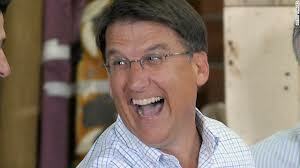 McCrory beat Dalton by over 500,000 votes last November. It seems that a majority ofthe voting public wanted anyone except a Democrat. Pearce just has his jock strap in a wad because the R's are in charge.